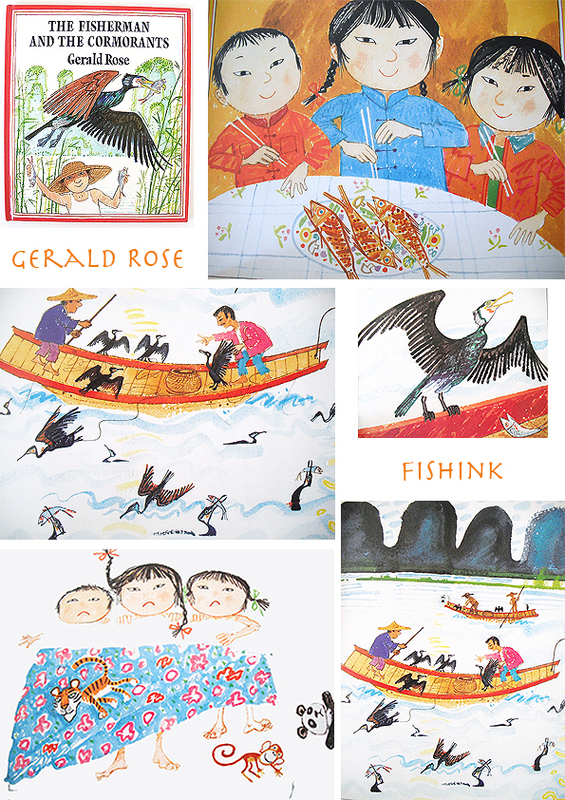 Gerald Rose was born in Hong Kong. When the Second World War started, his father became a prisoner of war, and Gerald and his mother were interned in a civilian camp, which was where he saw his first live tiger. 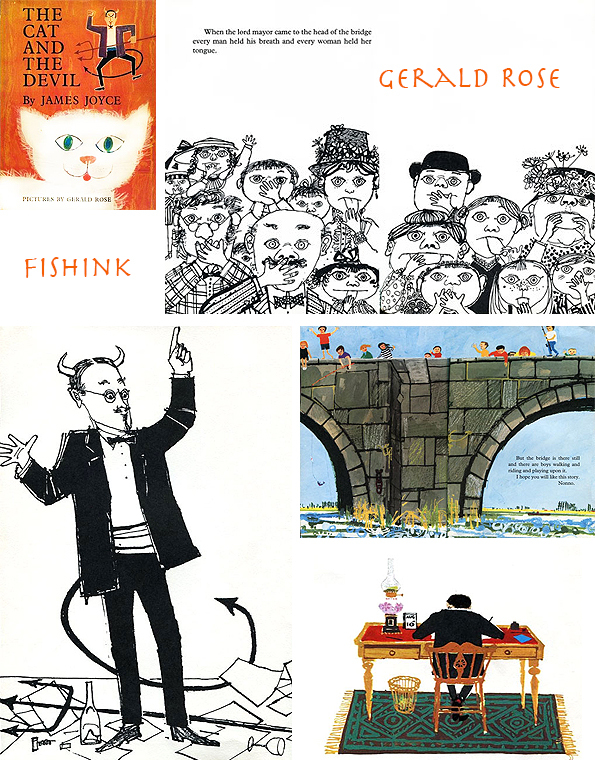 He has illustrated quite a few books with his quirky, humorous drawings. 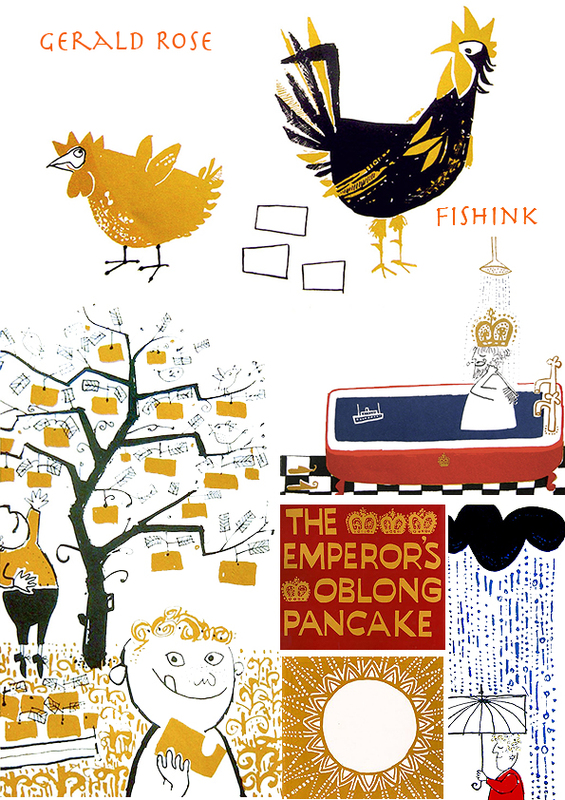 Thanks to Brain Pickings for posting these amazing images accompanying a James Joyce novel. 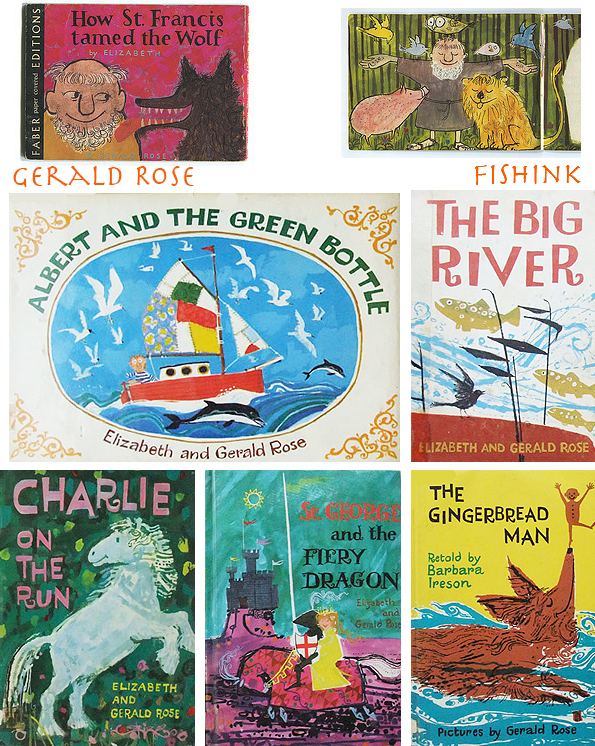 and also to The Art of Childrens Picture Books for these. Gerald studied at Lowestoft School of Art and the RA schools. 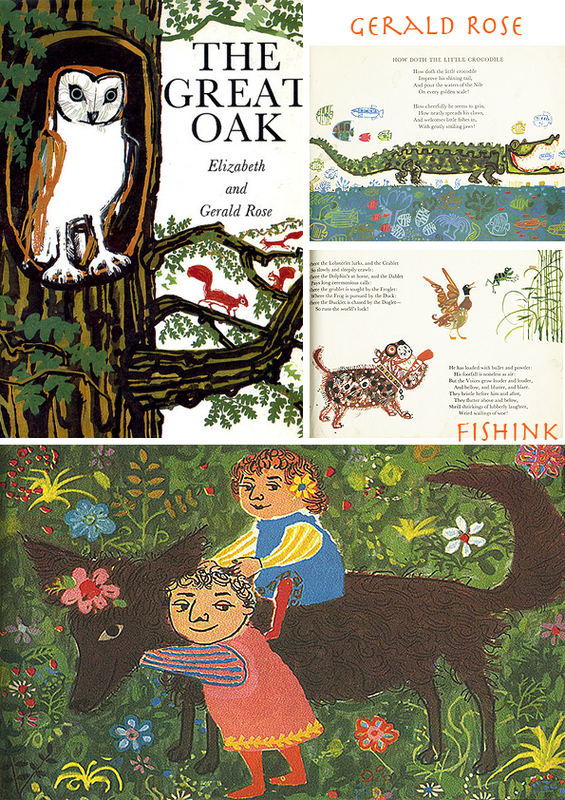 Frustrated by the dearth of good illustrated books for children, his wife, Elizabeth, helped him to write and illustrate a number of books. 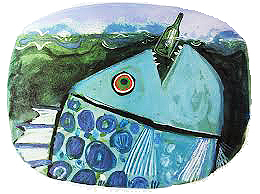 Gerald won the Premio Critici in 1979 in Erba, Italy for ‘Ahhh! 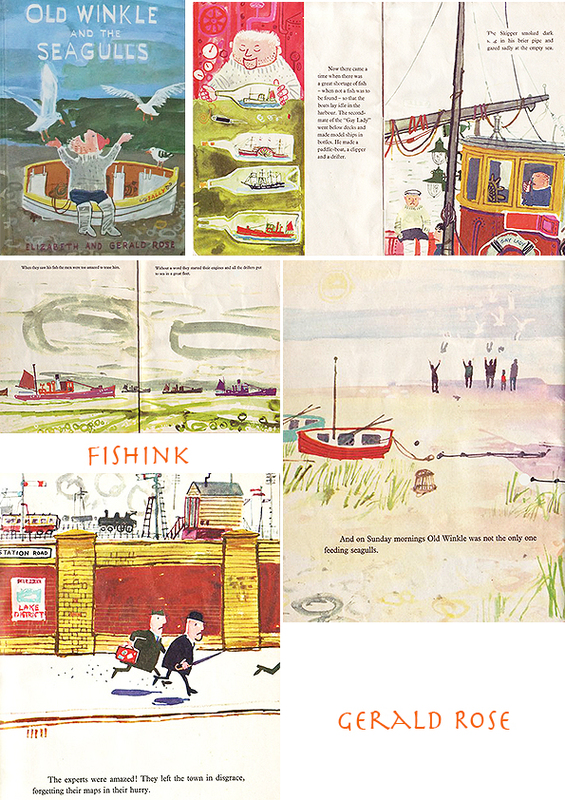 Said Stork’ and won the Kate Greenaway Medal in 1960 for ‘Old Winkle and the Seagulls’. These are amazing they really make me smile. Gerald now lives in Hove, East Sussex. 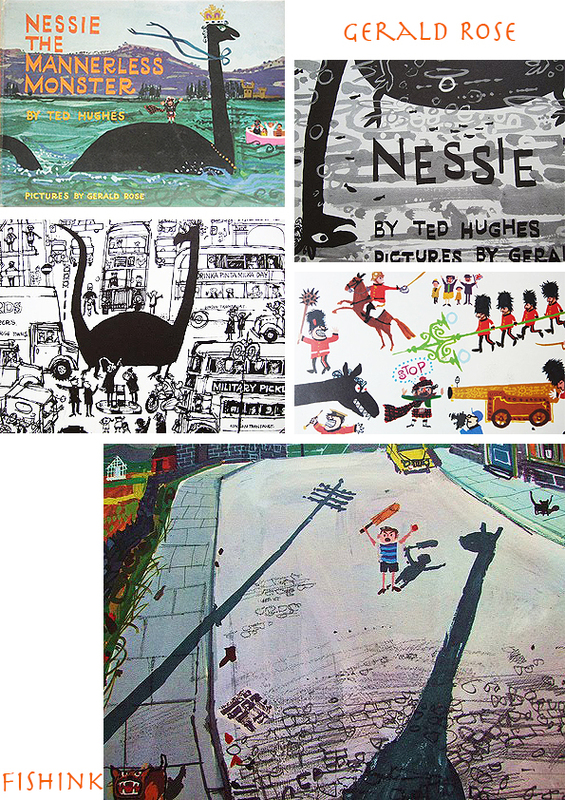 Look at this funny Ted Hughes story about Nessie the Mannerless Monster ! Or ‘ Albert and the Green Bottle ‘. Grandmother Oma and her inventive uses of her umbrella. 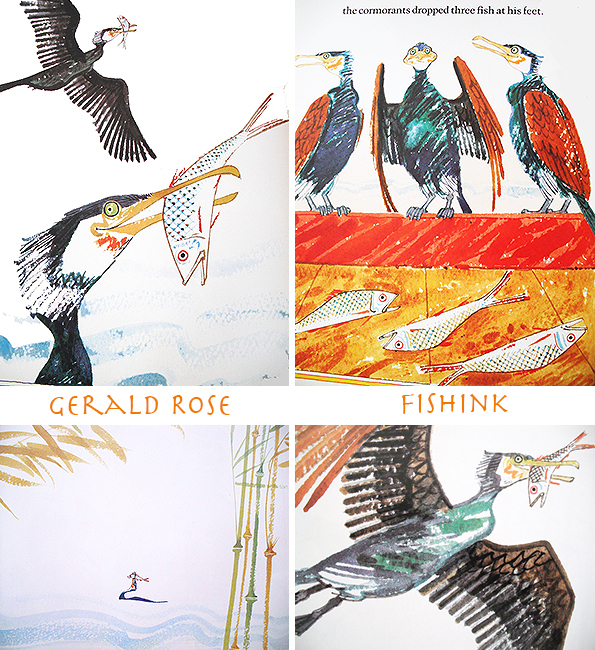 Or these beautifully observed illustrations of Cormorants and the Chinese lifestyle. 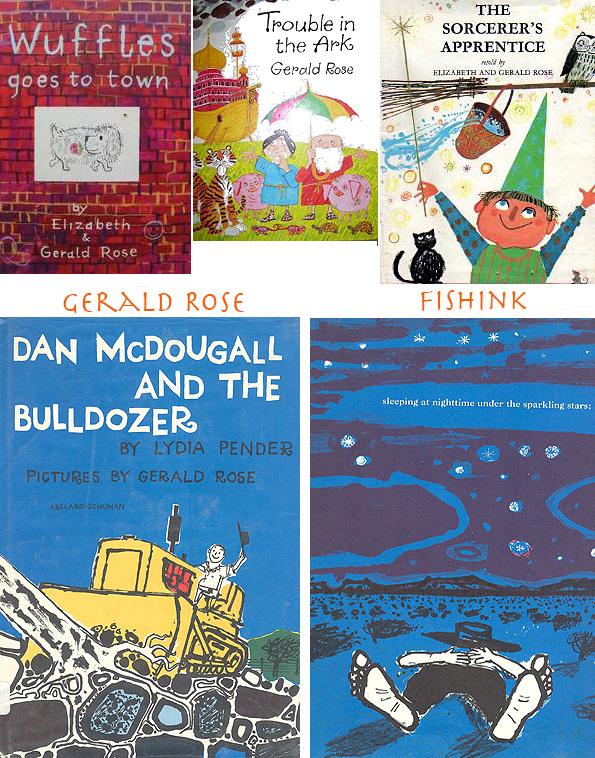 Gerald has such a wonderful variety of styles, all with a great sense of humour. His characters are so rich in emotion. 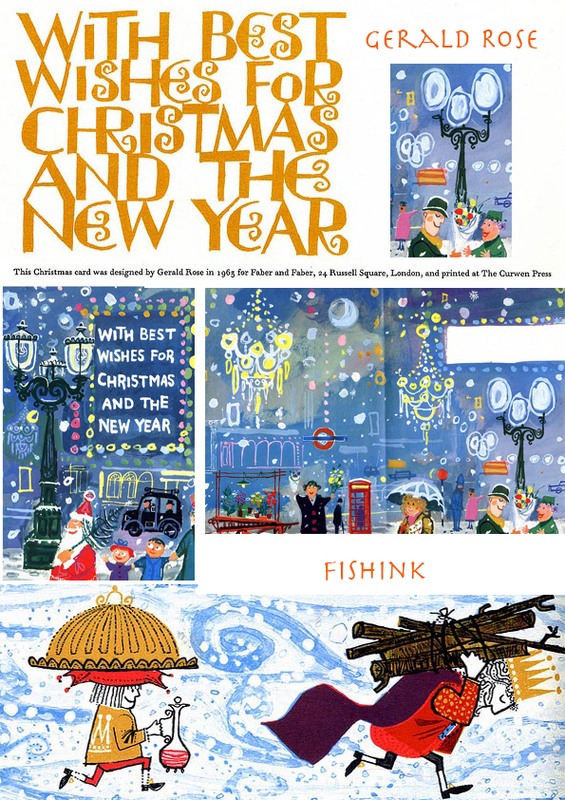 Many thanks to Hazel Terry and many more for posting images of Gerald’s fascinating work. 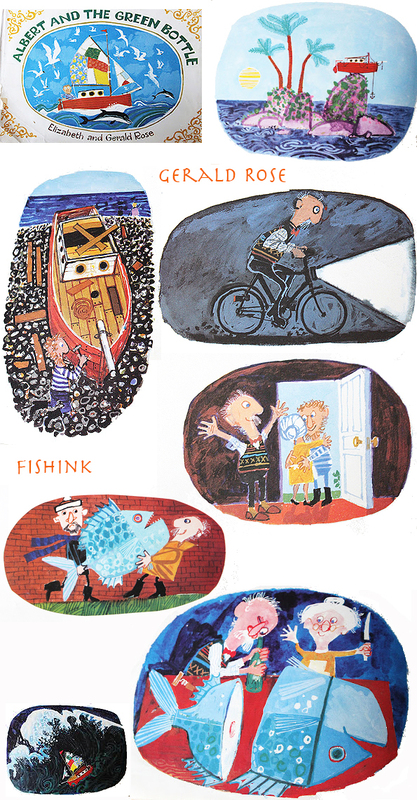 Reblogged this on The Picture Book Illustration Blog. Thanks Nick, glad to see other like minded people like yourself appreciate Gerald’s work too. Great to have you ‘onboard’ as it were. I love his work and ordered another book of his last week. So funny to remember that he trained in Lowestoft near to where my family have lived since I was 11 yrs old. Thank you for putting together such a comprehensive blog post about his wonderful work. 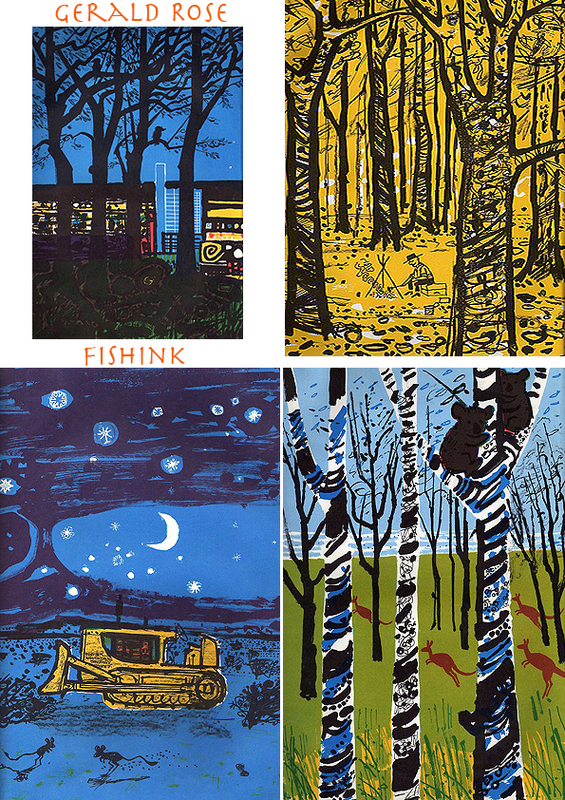 Hi Hazel, I really enjoyed exploring Gerald’s work, it was a joy to assemble this post. Lovely to hear from you, Your blog is a constant inspiration. Keep up the great work. 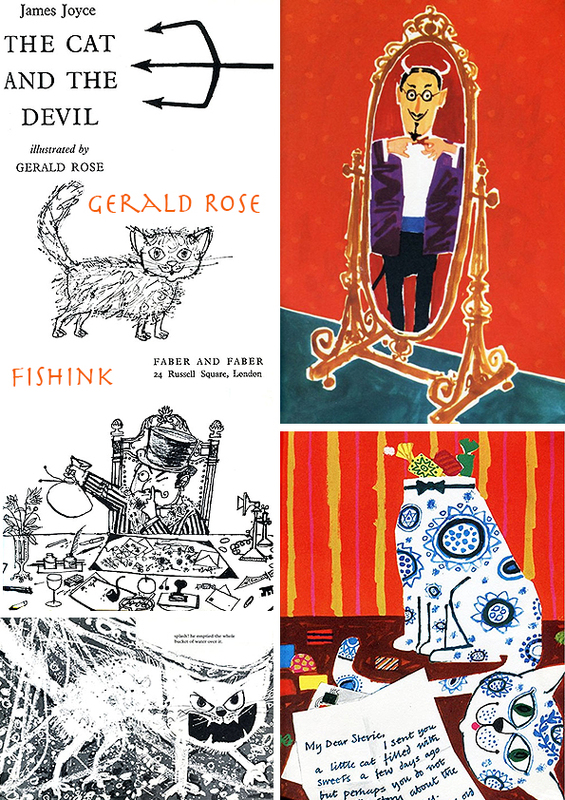 I’m a big fan of Gerald Rose, he had a wonderful way with composition and his work also had warmth and a sense of humor to it. Great post. I agree Jil, a very versatile artist with a great range of styles but, as you say, with that warm feel good factor that also raises a smile. Nice to hear from you, hope you’re well. My children were besotted with Gerald’s book; ‘Horrible Hair’. I was often to asked to read it several times each evening for months. I wrote to Mr Rose to let him know how much we have enjoyed his story, and was surprised to receive a handwritten card with one of his fab illustrations on the front. He told us about his family member upon whom one of the characters had been based.What an absolute gentleman. Great story Julia, thanks for sharing that with us. I forgot to say that not only did he take the time to reply, he also gave my children another of his books; ‘ The Tiger Skin Rug’, which he told us was out of print at the time. Gerald Rose was my tutor at Maidstone College of Art ,in 1972.He gave me confidence in my ability and very good advice. He sounds like he gave you a great start Jane. Lovely to hear your story, thanks for sharing it with us. 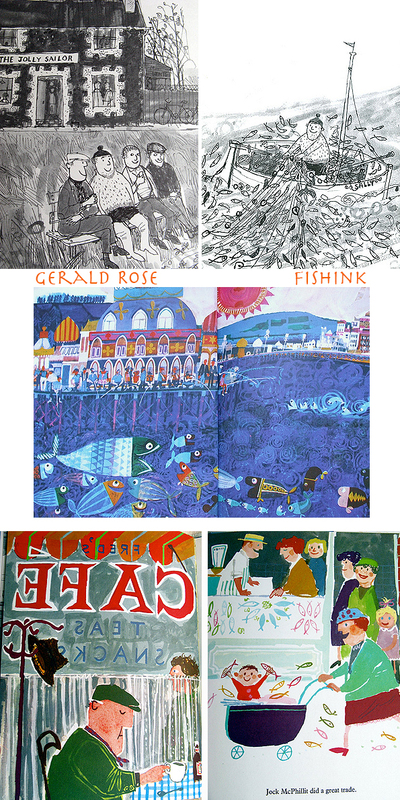 Gerald Rose was my painting tutor when I studied painting (NDD) in the early 1960s. 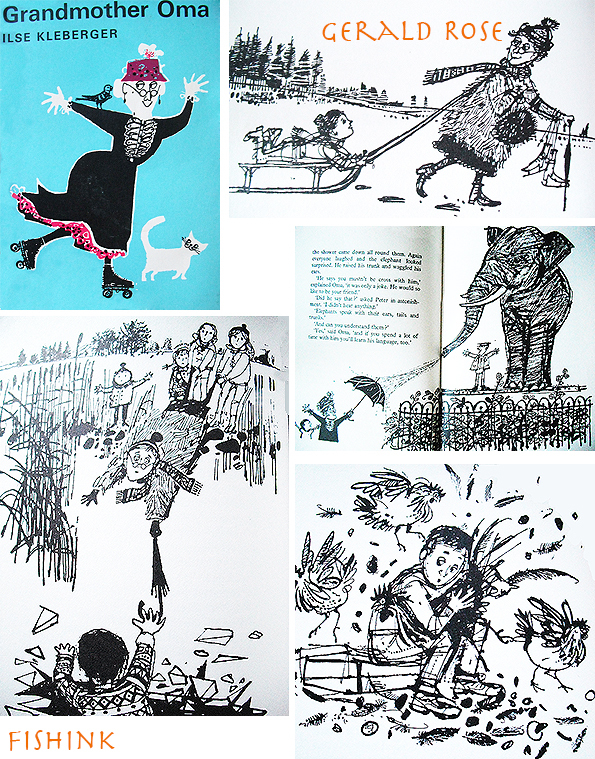 He was a “a breath of fresh air” as a practitioner, highly prolific, the master of less is more in drawing out the narrative of witty, humorous, situations. His use of colour was bold and intuitively harmonious. A pleasure to revisit his images which look as strong now as they did over 50 years ago. A magical duo with his wife, Elizabeth, as writer….they have brought a “serious” amount of pleasure to children over many decades as they will do for evermore. I had the immense honour and great joy to regularly visit Gerald & Liz Rose in the 1970s, being a penfriend to their son Richard. I could thus share the family life and even witness the creation process of many of the books in this post, most of which I preciously keep in my library. 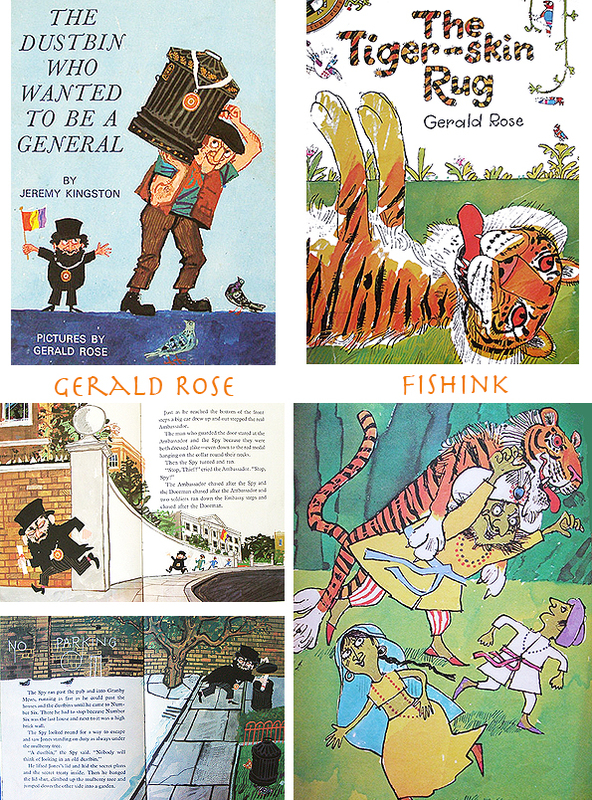 Apart from a successful book illustrator, Gerald was also a praised Art teacher and, in my opinion, an unjustly ignored Painter (he used to paint some unbelievable canvas of his beloved English Channel cliffs). Gerald & Liz and their 3 children were like another family to me and my brother (who exchanged with Martin, their elder son), and remain ever since. Both are aging now, but they can count on the love they so lavishly spilled over the years, through their books and their very lives. IL TAPPETO DI TIGRE | Scelgo un libro per bambini!